Recently, on a visit to Uganda for work, I was fortunate enough to visit Gulu, Uganda in the north. Gulu was the epicenter and widely affected by a long war in Northern Uganda, they are still very much in a phase of healing and recovery. The objectives of this portion of our trip revolved around community engagement and capacity building for ICT skills for the ND program for which I’m working. So in addition to visiting Gulu University, we decided to see first hand BOSCO-Uganda, a well respected NGO working to break the isolation of extreme poverty with ICT’s. As full disclosure, I’ve also been serving on the BOSCO-USA board of directors for the past 15 months. For a little more about BOSCO-Uganda, here’s a nice intro video put together by the University of Notre Dame’s Center for Social Concerns. CSC Gulu from Matt Cashore on Vimeo. While in Gulu we stayed at the Catechist Training Center, headquarters of BOSCO-Uganda and were hosted by the gracious Executive Director of BOSCO-Uganda, Fr. Joe Okumu. Both nights we had power grid problems (thanks Umeme), but what I found fascinating, while sitting in the dark, I was still able to connect to the Internet, through the BOSCO system. Which is powered by solar, generators and batteries – amazing. The morning of our first day, after meetings at Gulu University, we spent time visiting with the dedicated technical and programming staff for BOSCO-Uganda for an overview of the systems and ICT training programs. BOSCO-Uganda is fortunate to have a partnership with the Austrian organization HorizonT3000, for additional expertise. On Saturday, January 14, we traveled with a couple of the BOSCO-Uganda staff to Villages In Action, a village community event outside of Masindi, where we introduced them to another group doing great things in Uganda, Solar Sister. 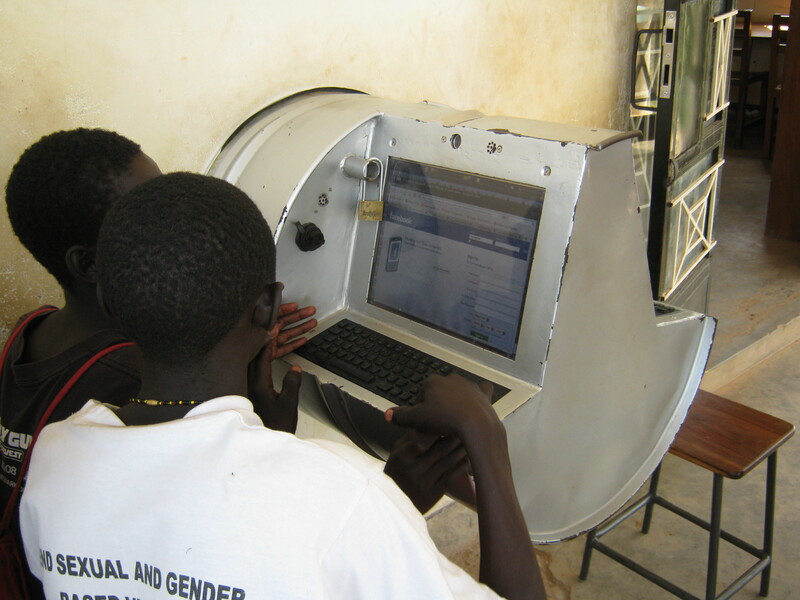 Gulu youth, accessing Facebook through a "digital drum"
Our first stop was to the library in Gulu, where ICT training and access to the Internet are offered. The youth of Gulu, Uganda were gathered around a table, engaged and learning about the various hardware associated with a laptop computer and then a standard desktop. The ‘students’ were enthusiastically learning about the devices that provide access to a wider world, it was so exciting to see. 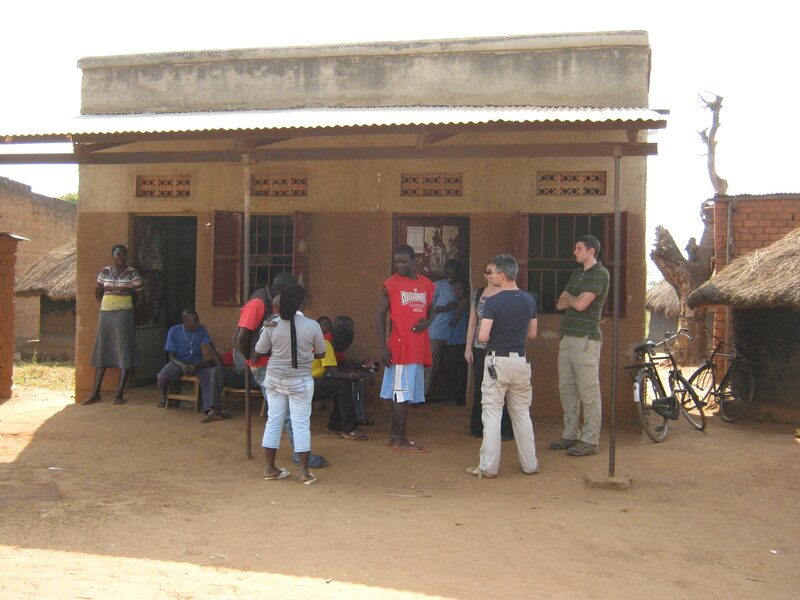 We then traveled to the village of Coope (pronounced Cho-pay), where a BOSCO network relay site for and a community center serve as a focal point of the community. It was thrilling to see that the community center serves as a hub of activity, connection, and learning for the residents – both young and old. One could feel the sense of ownership of this center by the local community, they were very proud of the services and function it provides in their village. This is a key tenant of BOSCO-Uganda, local capacity and community ownership is critical to success. 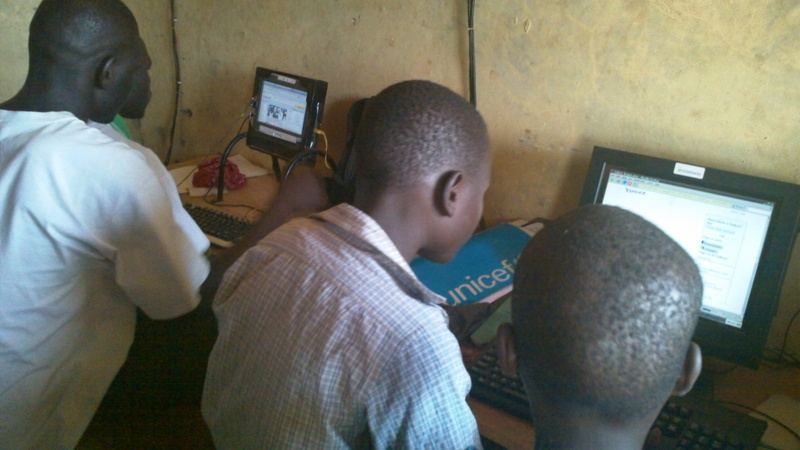 From an ICT4D perspective, BOSCO-Uganda is doing it right. The highlight of my visit to Coope, was assisting a boy (maybe 10-12 years old), in setting up a Yahoo email account, very inspirational. With the ubiquitous nature and usage of social media, many of these kids set up an email account, so they can then begin using Facebook and Twitter. In doing so, these kids, in a remote Ugandan village, affected by war – are exploring our global community and bringing the world a litte closer. Breaking their isolation.